Student Carlo Giulietti (defended MS thesis, May 2010) along with co-advisors Profs. Ansari and Schonfeld received the Best Paper award at the 2010 ACM Workshop on Advanced video streaming techniques for peer-to-peer networks and social networking. This workshop is part of ACM Multimedia, held on October 25-29 in Firenze, Italy. 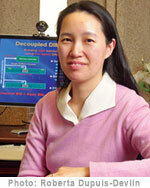 link Professor Derong Liu from the Department of Electrical and Computer Engineering has been elected to serve on the Board of Governors of the International Neural Network Society effective January 2010.